There were many in the past who claimed to have mediumship abilities and if you do a search on Google you will most likely eventually come across photos such as the one above. But who is the lady pictured? I wanted to research and find out..
Mina Crandon, who became known as "Margery" was a lady who lived between the years 1888 to 1941 and became famous for her claims to be a medium. The truthfulness of her claimed abilities became very controversial, with plenty of supporters claiming she was the real deal and had extraordinary abilities and skeptics saying she was an outright fraud. According to records, Mina had no supernatural experiences early on in life and only developed an interest in spiritualism due to the influence of her husband Le Roi Goddard Crandon, who was a Surgeon at the time. Mr. Crandon was apparently very troubled by the idea of death and this lead him to develop an obsession with spiritualism and the setting up of spritiualist "Home groups" which would meet up and regularly perform seances. During the course of these seances, Mina had come into contact with a psychic who informed her that a young man was attempting to make contact with her from the spirit world. This young man would turn out to be Minas younger brother who was called Walter. Walter had died in 1911 as a result of a rail accident. As time went on, Mina claimed to be in contact with Walter and that her deceased brother was now acting as her spirit guide, which marked the real beginning of her abilities as a medium. Mina then became well known by conducting many seances in which bizzare things would happen. 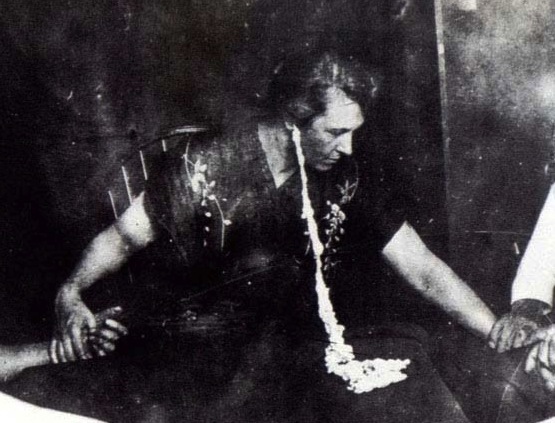 She developed the ability to manifest ectoplasm and channel spirits and gathered many supporters. 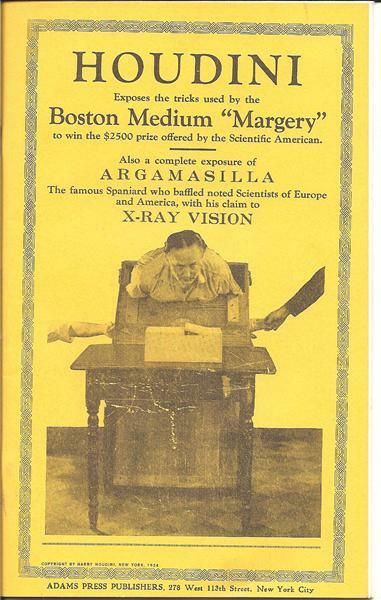 In 1923, Minas abilities were put to the test when a contest sponsored by Scientific American magazine promised prize money of $2500 to any medium who could clearly demonstrate genuine psychic ability. This contest was devised by J. Malcolm Bird, an editor of the Scientific American magazine. 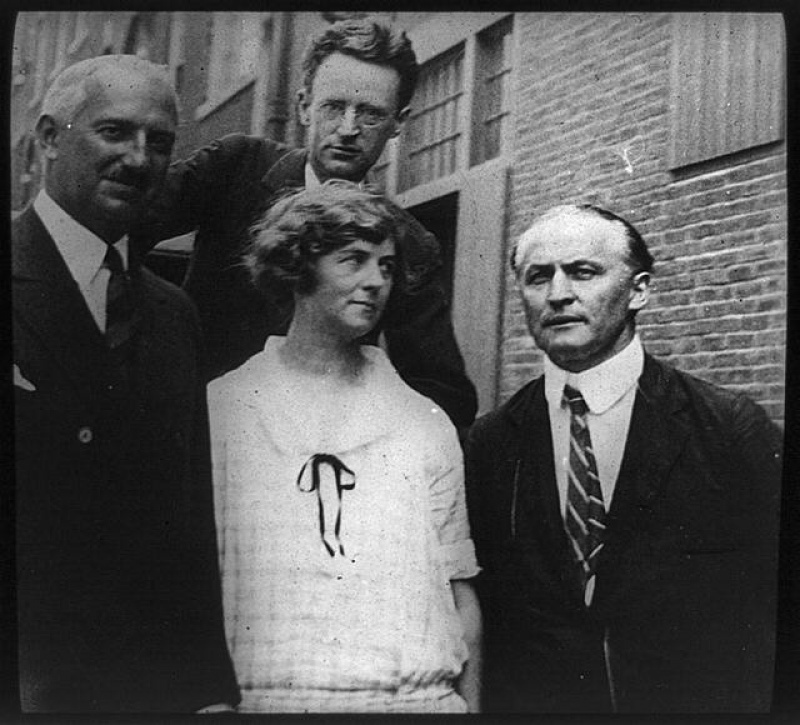 A panel of judges were set up which consisted of Walter Franklin Prince, an American psychical researcher; Daniel Comstock, who introduced Technicolor to films; Hereward Carrington, a popular occult writer; William McDougall, a professor of psychology a Harvard University; and finally- Harry Houdini the famous magician and escape artist. Once the investigation got underway, it became apparent that the judges were completely divided as to how genuine Minas abilities were. J. Malcolm Bird, responsible for the idea in the first place and also responsible for observing and recording data about the invesitgations, became convinced that Mina was the real deal and that some paranormal phenomena was genuinely occuring. Hereward Carrington was similarly convinced. Most of the judges were becoming swayed toward the idea of awarding Mina the $2500 prize, however there was a great deal of disagreement from Houdini, which caused friction and conflict. Houdini maintained that Minas was a fraud. Apparently, this conflict had been present throughout the invesitgation and Bird even wanted Houdini disqualified from the panel, presumably due to feeling that Houdini had an unreasonably hostile attitude toward any of the phenomena being produced and documented. 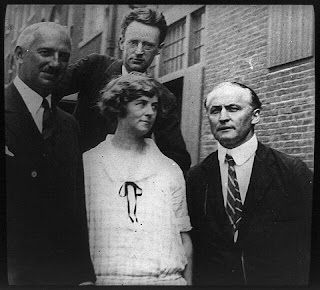 As the Judges considered awarding Mina the prize, Houdini was so outraged that he said he would travel to Boston where the seances were being held and was utterly determined to prove Mina to be a fraud. Mina and many of the other judges did not trust Houdini and felt he was deliberately out to get her. Houdini claimed that during the seances, Mina was using a number of deceptive tricks, such as making noises with her feet and moving and lifting objects in the dark herself which had been claimed to of been lifted by the spirits. However, Houdini was not able to expose Mina right away and demanded further tests be carried out. The ultimate test came when Houdini demanded that during the seance, Mina be bound up in a box which only had holes in for her head and her arms and to continue to demonstrate phenomena such as the ringing of bells and so on. According to reports, Minas spirit guide Walter, was apparently very angry with what Houdini was doing and the top of the box Mina was bound up in appeared to be ripped off by an invisible force. On one occasion when Mina had been fastned back into the box which had a numerous padlocks, Walter came through when Mina was in trance and told the people present that Houdini had rigged the bell so that it could not work. Once examined, the bell was indeed rigged with a piece of rubber so that it could no longer work but Houdini denied any involvement. On another occasion, Walter explained the Houdini had placed a ruler inside the box that Mina was bound up in, which was also found after examination. The theory was that Houdini would be able to accuse Mina of being a fraud and later people would investigate and find that Mina had a ruler which she could use to produce various phenomena in the seance room. It would appear on these occasions Houdini had been caught deliberately trying to set up a medium and expose her as a fake when he was in fact lying. Due to the Judges not being in agreement, the $2500 was never awarded. 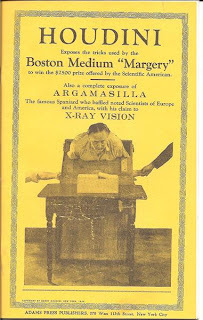 After these incidents, Houdini then published a book entitled "Houdini Exposes the Tricks Used by the Boston Medium Margery" which claimed that he had debunked Minas abilities and exposed her as a fraud. This caused outrage amoung Mina and her supporters. J. Malcolm Bird would lead the fight back against these claims by also publishing a book in support of Minas abilities and what was witnessed, which woudl eventually convince many others. Hundreds of pages of the American Society for Psychical Research journal were also devoted to documenting Minas abilities. 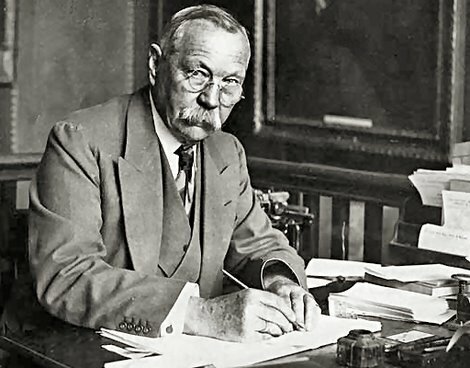 One Minas most famous supporters was Sir Arthur Conan Doyle, who wrote the Sherlock Holmes stories. Doyle was a firm supporter of spiritualism but also ironically good friends with Houdini. In one of Doyle's books "The Edge of the Unknown"- he devotes an entire chapter to the incidents described above involving Minas mediumship and Houdini's attempts to debunk her. I would recommend reading this. Here's the google books link which enables you to read the chapter about Houdini, in which Doyle also reveals that he believed Houdini possessed REAL paranormal abilities. Later during Minas mediumship, she began to produce a new type of physical phenomena. Two dishes would be placed on the table in front of her, one containing cold water, the other containing warm water. In one of the dishes was a piece of wax, which it was claimed when this wax softned, Walter- Minas spirit guide / deceased brother , was able to make an impression of his thumb in it. This was later exposed to be fake, as the thumbprints were found to be those of Minas dentist! Critics also claim that Mina flirted and had affairs with some of the people who would be present in her seances. So was she the real deal? I do not know. But the importance of this story is that things are often much more complicated than they first seem and you need to do your research and read different eye witness accounts and so on. You cannot assume the skeptics are necessarily the good guys who only use honest means to investigate and have no biases of their own, because in many occasions, the skeptics will use deceptive tricks of their own. Also, certain claims made by various individuals become confused with "facts" over time. For instance, I note that the wikipedia article on Mina Crandon portrays her to of been successfully debunked by Houdini, when in actual fact I was unable to find evidence that this was definately the case. The more I research into the history of those who claimed to be mediums the more I find that things not as clear cut and simple as they seem and there is often a wealth of information for believers and skeptics alike to chew on. That's what makes it so interesteing. Mediums: Are some real? Or are they all fake?